The impacts of Storm Imogen are expected to continue over southern parts of England. The impacts of Storm Imogen are expected to continue over southern parts of England today and into tomorrow. 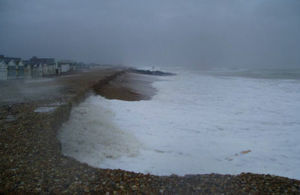 A combination of severe gale or storm force winds, high tides and heavy showers mean there is an increased coastal flood risk. Today, storm force winds have brought large waves and spray to the south-west and south of England, particularly the Devon and Cornwall coasts, the Bristol Channel, and parts of the Kent and Sussex coastline. Flooding of coastal roads and isolated coastal properties is possible. There is also a ongoing risk of river flooding from the River Wye today and the River Severn until Friday as they continue to rise in response to heavy rainfall. Today, Storm Imogen continues to bring large waves and spray to the south and south-west coastal parts of England. Storms can be exhilarating, but please keep safe. In recent years an increasing number of people have put themselves, family members and rescue workers at severe risk while wave watching and taking storm selfies. Please remember to take extreme care on coastal paths and promenades. Flooding of low lying coastal roads is also possible, people should also avoid driving through flood water: just 30cm of flowing water is enough to move your car. There is also a ongoing risk of river flooding from the River Wye today and the Severn until Friday as they continue to rise in response to heavy rainfall. Environment Agency teams are on the ground monitoring the situation and will issue flood warnings and alerts as required. Anyone can keep up to date with the latest situation on GOV.UK or follow @EnvAgency and #floodaware on Twitter for the latest updates. While we want people to enjoy Britain’s coastlines, it’s important to respect the weather, which can get particularly ferocious around the coast. If you get caught up or swept out to sea your life will be at risk very quickly and our rescue services will also be at great risk. Look out for updates from the coastguard and police, and on the Environment Agency website for flood warnings.